The Home tab on the Site card houses several subtabs (Info, Redirect and Attribution) as well a couple buttons (Pixel and Test). The Site Card > Home subtabs document outlines all of the aforementioned tabs and buttons on the Home tab in much greater depth. Hidden: a setting that hides an Site from being visible in the Affiliate Portal. To be used as a 'test' or 'pause' mode. 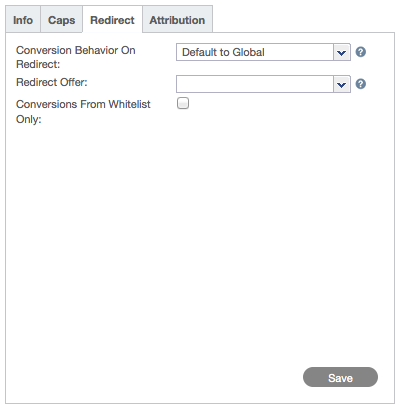 Conversion Behavior on Redirect: what should occur to conversions that result from clicks that occurred prior to hitting cap or after the Site has met cap. Redirect Domain: if a specific redirect domain is to be used for tracking links for this Site. Conversions From Whitelist Only: determines whether CAKE will only accept conversion pixels received from whitelisted IP's (set in the Advertiser tab). Track Search Terms From Non-Supported Search Engine: Will capture any 'search term' from referrer URL's even from non-recognized sources. Last Touch: changes the attribution model for this Site from the default first touch setting to last touch which recognizes the last unique Affiliate as the conversion source. 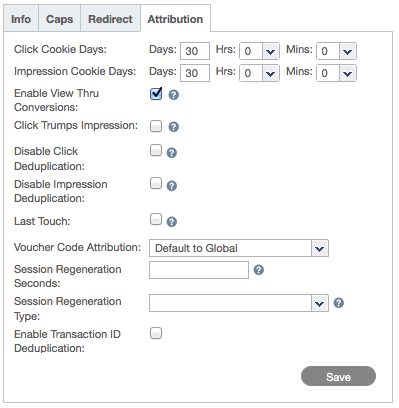 Session Regeration Type: an override of the default cookie-based attribution to recognize a manual criteria as the 'unique' identifier. For example 'IP only' will recognize all clicks from the same IP as the same user, regardless of whether they actually are. Creatives are the advertising assets that you provide to affiliates for the purpose of generating traffic to their Site. The Creative tab is going to display all creatives that have been uploaded for this Site. Link Override: to be used in the event the creative has a specific redirect destination that is different than the default Site landing page. This does not apply to deep-link situations where the redirect destination is specified in the click-through URL by the traffic generating source. Created: Date the creative was added. Expiration: Date the creative is due to be inactivated. Anything sent to this creative past the expiration date will redirect. With all creative types other than a link, CAKE will automatically look for HREF links in the content of the file for the purpose of replacing them with our token for the click-through link - #url# - which will in turn be replaced by an actual tracking link for the respective partner and creative. Link: Simply a link that can be provided to an affiliate that will redirect to the Site link. Email: Intended to be used in an email. Supported file types include: HTM, HTML or TXT file. In addition to the click-through link token (#url#) when third party suppression list management systems are being used, there is an additional token for unsubscribe links - #unsub#. Image: CAKE will support any static image file type (such as a .png, .jpg, .gif) which will require the Affiliate to host and wrap with the respective click-through URL. 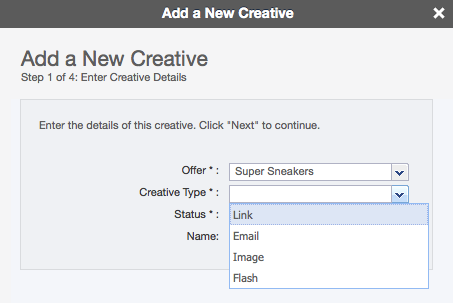 CAKE can also support an HTML file in the event you get a coded flash creative, ad tag, or hosted creative. In this event, you may be uploading a HTML file or you may be uploading multiple files if the images are not hosted. The HTML file will be used for previews when available. Add Creative: The Add Creative button is located in the Creative tab of the Site card and allows for the upload of individual creatives. This import tool supports any of the creative types. Batch Creative Upload: The Batch Creative Upload button is also located in the Creative tab of the Site card and allows for multiple image or flash creative types to be uploaded at one time. A campaign is the 1 to 1 relationship between an Site and an affiliate sending traffic to that Site. The Campaigns tab lists all of the affiliates that have campaigns for that Site. Campaign: This will include contract details, price format and payout. Displayed as a hyperlink, clicking the campaign will open the Campaign card. Source: The traffic generating source (this may be the Affiliate when relevant). If displayed as a hyperlink, clicking the source name will open the Source card. Original: Indicates whether this is an original campaign - meaning a unique (or the first) campaign for that affiliate. Additionally, there are two buttons in the upper-right corner of the grid. Add Campaign: Add a campaign from this tab. Clicking this button opens the Add Campaign wizard. Export: This will export the campaigns into a CSV file. The Targeting tab controls all allowed and non-allowed traffic for an Site. When an Site is first created, all traffic is allowed. To restrict allowed traffic to this Site, you have two options. Either Geo (country-level) targeting, or Rules targeting which includes a variety of expanded options including user agent, location (country and region), OS (operating system), device, browser, language, ISP or carrier, referrer, or URL. This also includes a very basic percentage split functionality fo A/B testing. Geo Targeting lets you select allowed countries, redirecting all traffic from outside those countries. Users clicking on a CAKE unique link from an IP Address of a disallowed country will redirect to a specified GeoTargeting redirect Site if one has been added, falling back to the standard redirect strategy. Disallowed countries are indicated with a red dot in the 'Allowed' column. 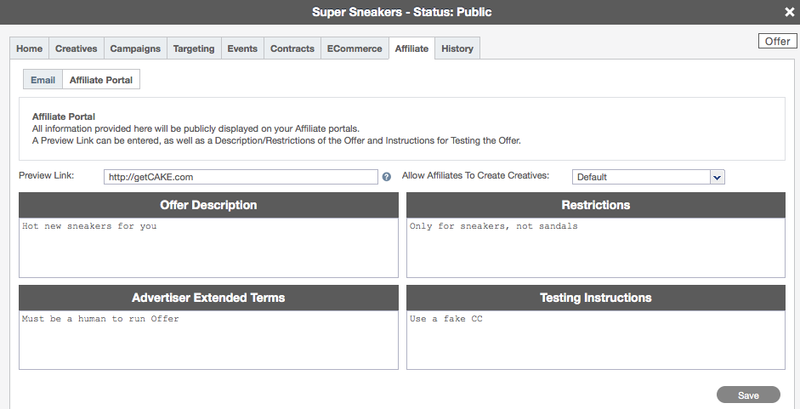 Like most targeting applications, you will use RULES for its flexibility. RULES assumes that all traffic is allowed except for the conditions listed. The rules are comprised of targets, which allow you to add layers of criteria for example, location and device. 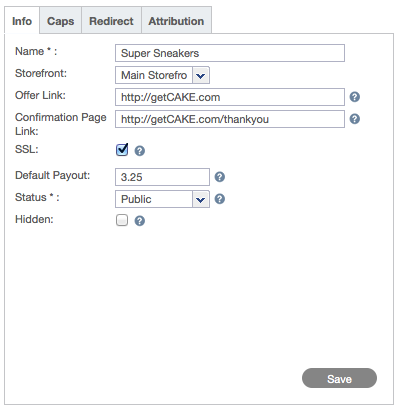 When a user clicks on a CAKE unique link, CAKE will evaluate every rule listed in the order it is listed, eliminating all redirect criteria. Whatever remains will track on the Site the traffic was sent to. Rules are listed in the order processed. Rule status is indicated by green (Active) or red (Inactive) dots in the Active column. Rules can be shared among other Sites. Shared status is indicated by green (can be shared) or red (cannot be shared) dots in the Shared column. The redirect destination (Site contract or Site) for that rule is listed in the Redirect column. There are two icons on the right: Edit indicated by the paper and pen icon and Delete indicated by the stop-sign icon. Events are actions that occur before, after, or in place of a primary conversion or application install. Events are created and maintained at the Advertiser level and can be activated or deactivated at the Site level per each Site that utilizes them. Site Contracts are a variation of the original Site. These include different price formats, allowed countries (and possibly corresponding landing pages), device-optimized pages, or any other variation that either requires specific conditions (caps, expirations) or that you would like to report separately. The left-hand panel lists the Site Contracts. 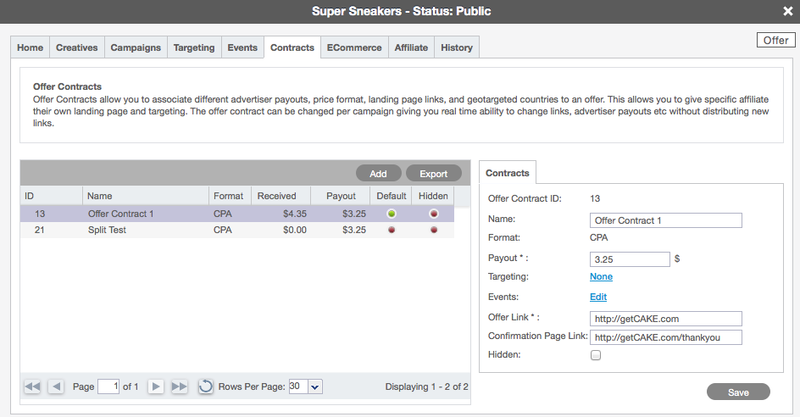 Clicking on the SiteContract will open the Sitecontract details in the right-hand panel. 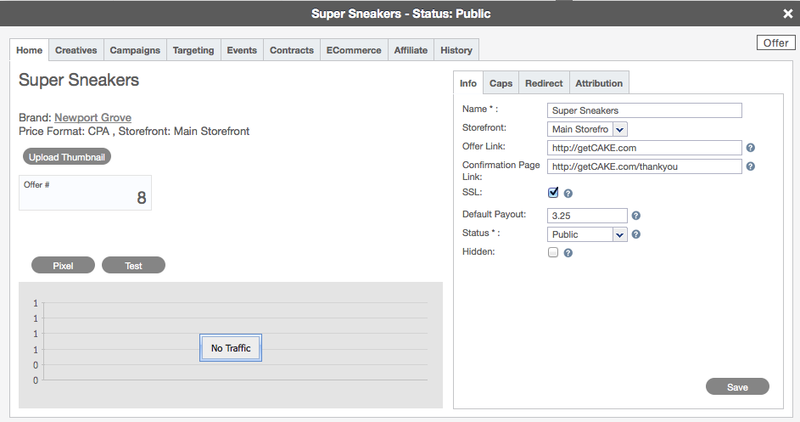 SiteContracts can be edited in the right-hand panel. For a complete overview on the setup of Site Contracts please see the Site Contracts document. 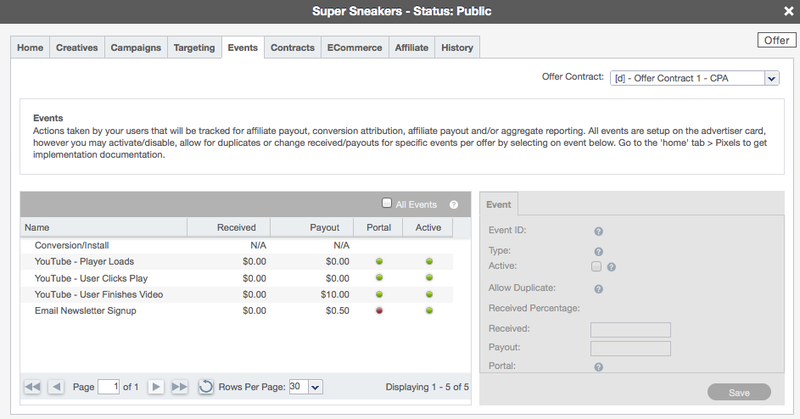 The Ecommerce tab on the Site card allows you to add Related Products as well specific Ecommerce Payout Rules. This tab is only prevalent if you are a client who is licensing the Ecommerce side of the CAKE platform. For a complete overview of Ecommerce and the Ecommerce tab on the Sitecard please see the Ecommerce: Admin Setup and Configuration Guide. Applicable for the Affiliate channel, the Affiliate tab on the Site Card contains information relevant for third parties promoting an Site. Separated into two subtabs, the Email subtab includes any information related to Email marketing (from and subject lines, and suppression information) and other general information pertaining to the Affiliate as a reference. The Email subtab contains information for email campaigns if applicable. Unsubscribe Link: A user can click on the unsubscribe link to opt out of further emails regarding this Site (product or service). Suppression List: An association to a specific unsubscribe link that can be managed directly by the Advertiser or through a third party service. From Lines: Approved From Lines to be used for the email campaign. Subject Lines: Approved Subject Lines to be used in the subject of the email campaign. The Affiliate Portal subtab contains additional information relevant to the affiliates who have an active campaign with this Site displayed in the Affiliate Portal. Preview Link: A direct link to the landing page, intended to provide the Affiliate a preview of the page they are directing traffic to. This link is not intended to drive traffic to as it will not track. SiteDescription: A space to include any details that may be beneficial for affiliates to know regarding that Site such as the conversion point and optimal audiences. Restrictions: If the user has specific restrictions for this Site (such as allowed countries and specific payment exclusions), they can be defined here and affiliates will be able to see the text or html from their Affiliate portal in their Sitecard. Advertiser Extended Terms: If the advertiser has specific extended terms that an affiliate must agree to or that conflict with your general terms and conditions, they can be defined in this text box. Affiliates will see the text when accessing the campaign card, and the affiliate is required to click the "I agree to the Terms & Conditions" checkbox before being granted access to the Site. This will occur every time the conditions are changed. Testing Instructions: Any testing instructions for this Site can be defined here and is strongly recommended if any validations are in place, if your Advertiser requires certain data entries to specify tests (sample credit card numbers, or first name = 'TEST', etc), or if there are any helpful tips or tricks to successfully submitting a test to verify the Affiliate conversion pixel fires. The History tab contains an audit trail of activity pertaining to this Site. The History tab will display a summary of the action that took place, who made the edit/change and when the edit/change was made with a date/time stamp. Similar to all History tabs, this section also allows for notes to be saved which are searchable using the search bar.